Stump the Priest: What is the Nous and how is it distinct from the Soul? Question: "What do we mean by the "nous," how is it distinct from the soul, and are the Orthodox the only ones who speak about the "nous"?" "The chief concern of the Orthodox Church is the healing of the human soul. The Church has always considered the soul as the part of the human being that needs healing because She has seen from Hebrew tradition, from Christ Himself, and from the Apostles that in the region of the physical heart there functions something that the Fathers called the nous. In other words, the Fathers took the traditional term nous, which means both intellect (dianoia) and speech or reason (logos), and gave it a different meaning. They used nous to refer to this noetic energy that functions in the heart of every spiritually healthy person. We do not know when this change in meaning took place, because we know that some Fathers used the same word nous to refer to reason as well as to this noetic energy that descends and functions in the region of the heart. We should point out that there is a difference in terminology between St. Paul and the Fathers. What St. Paul calls the nous is the same as what the Fathers call dianoia. When the Apostle Paul says, "I will pray with the spirit,"[1 Corinthians 14:5.] he means what the Fathers mean when they say, "I will pray with the nous." And when he says, "I will pray with the nous," he means "I will pray with the intellect (dianoia)." When the Fathers use the word nous, the Apostle Paul uses the word "spirit." When he says "I will pray with the nous, I will pray with the spirit" or when he says "I will chant with the nous, I will chant with the spirit," and when he says "the Spirit of God bears witness to our spirit,"[Romans 8:16] he uses the word "spirit" to mean what the Fathers refer to as the nous. And by the word nous, he means the intellect or reason." Many Fathers use the words "nous" and "soul" interchangeably. St. Gregory Palamas uses the word "nous" in two senses: as the whole soul, and also as the power of the soul. Other Fathers use the term "nous" to refer to refer to "attention" as opposed to reasoning. And so for example, when we pray, we may be reading our prayers with our intellect, but our attention wanders. And so when one achieves the prayer of the heart, our attention (the nous) returns to the heart, and we truly pray. Contemporary Protestants will typically only talk about the "nous" to the extent that they find references to it in in Scripture, and they generally would not spend a lot of time (if any) trying to understand what the Fathers had to say about those passages. Being influence by American pragmatism, they would also tend to see spending time focusing on the nuances of the mind, heart, and soul of a person to be of little use to the bottom line questions of how one is saved, and how we should live our lives, which they tend to see in far more simple terms, and look for far more simple answers. If you were an Eskimo, you would speak about various forms of frozen water with subtle distinctions that would be lost on tribesmen who live near the equator, because those people don't often encounter frozen water, and so hail, snow, sleet, etc, would be seen as being pretty much the same thing. Whereas for you, ice, snow, sleet, and all the subtle variations one encounters of those things would be a pervasive reality that would never be far from your thoughts. The saints of the Church spent their lives waging spiritual warfare, and so speak about the aspects of the soul in very subtle ways, compared to those who think that if you say a prayer and ask Christ into your heart, that you are saved, and couldn't lose your salvation if you tried. Question: "Is the teaching that ultimately all men will be saved (the apokatastasis) a heresy, or is it an acceptable theological opinion within the bounds of Orthodoxy?" Origen taught the heretical doctrine of the apokatastasis, that ultimately everyone, even the devil, would be saved. The Church condemned this teaching at the Fifth Ecumenical Council. The Church has ever taught this as a fact since that time. However, in recent times we have had a rebirth of this heresy, and have many who try to argue that the Fifth Ecumenical Council did not condemn this teaching. Did the Fifth Ecumenical Council Anathematize this Heresy? "The Church, basing itself on the word of God, acknowledges the torments of gehenna to be eternal and unending, and therefore it condemned at the Fifth Ecumenical Council the false teaching of the Origenists that the demons and impious people would suffer in hell only for a certain definite time, and then would be restored to their original condition of innocence (apokatastasis in Greek). The condemnation at the Universal Judgment is called in the Apocalypse of St. John the Theologian the "second death" (Apoc. 20:14). An attempt to understand the torments of gehenna in a relative sense, to understand eternity as some kind of age or period — perhaps a long one, but one still having an end — was made in antiquity, just as it is made today; this view in general denies the reality of these torments. In this attempt there are brought forward conceptions of a logical kind: the disharmony between such torments and the goodness of God is pointed out, as is the seeming disproportion between crimes that are temporal and the eternity of the punishments for sin, as well as the disharmony between these eternal punishments and the final aim of the creation of man, which is blessedness in God. But it is not for us to define the boundaries between the unutterable mercy of God and His justice or righteousness. We know that the Lord "will have all men to be saved, and to come unto the knowledge of the truth" (1 Tim. 2:4); but man is capable, through his own evil will, of rejecting the mercy of God and the means of salvation. Chrysostom, in interpreting the depiction of the Last Judgment, remarks: "When He (the Lord) spoke about the Kingdom, after saying, ‘Come, ye blessed of My Father, inherit the Kingdom,’ He added, ‘which is prepared for you from the foundation of the world’ (Matt. 25:34), but when speaking about the fire, He did not speak thus, but He added: which is ‘prepared for the devil and his angels’ (Matt. 25:41). For I have prepared for you a Kingdom, but the fire I have prepared not for you but for the devil and his angels. But since you have cast your own selves into the fire, therefore accuse yourself for this" (Homily 70 on Matthew). We have no right to understand the words of the Lord only conditionally, as a threat or as a certain pedagogical means applied by the Saviour. If we understand it this way we err, since the Saviour does not instill in us any such understanding, and we subject ourselves to God’s wrath according to the word of the Psalmist: "Why hath the ungodly one provoked God? For he hath said in his heart: He will not make enquiry" (Ps. 9:34) (Orthodox Dogmatic Theology (Platina, CA: St. Herman Press, 1984, p. 349f). The advocates of Universalism try to argue that, despite the fact that the Church has consistently stated that the Fifth Ecumenical Council anathematized this heresy, that there are reasons to doubt whether the council formally issued the anathemas ascribed to it. "If anyone says or thinks that the punishment of demons and of impious men is only temporary, and will one day have an end, and that a restoration (ἀποκατάστασις) will take place of demons and of impious men, let him be anathema." "If anyone asserts the fabulous pre-existence of souls, and shall assert the monstrous restoration (ἀποκατάστασις) which follows from it: let him be anathema." In the parable of the Sheep and the Goats, Christ addresses the wicked (the goats) and said: "Depart from me, ye cursed, into everlasting fire, prepared for the devil and his angels" (Matthew 25:26); and he concludes the parable by saying: "And these shall go away into everlasting punishment: but the righteous into life eternal (Matthew 25:46). Those who advocate for this heresy are forced to place all their weight on the supposed advocacy of a few saints of the Church, while ignoring the clear and unambiguous teachings of all the other Fathers, the Councils, the Apostles, and even Christ Himself. This is not how Orthodox Christians approach such matters. We affirm that which the Church has consistently taught -- we do not go hunting for theological exotica. And if it happens that God has a surprise for us in eternity, and that despite all the talk of the unquenchable fire and the undying worm, He will ultimately save even the devil, then we have nothing to worry about. However, if Christ, the Apostles, the vast majority of the Fathers and saints of Church, the Councils, and the Synodikon of Orthodoxy are correct, then it is a very dangerous thing to give unrepentant sinners false hope -- because those who teach such a heresy will "both destroy themselves and become agents of eternal condemnation to others" (the Synodikon of Orthodoxy). This is not a question of what we may wish to be true -- it is a question of what Christ, who is Himself the Truth, assures us to be true, in the most emphatic terms. Question: "Where do we find any evidence that praying for the dead is a biblical? From what I have read it appears that the Bible almost says the opposite of this in Ezekiel Chapter 18. Sure, Ezekiel was talking to Israel prior to the New Covenant that we have in Christ, but it says at the start of the chapter that this came from the word of the LORD and it seems consistent with Romans 2:3-9." First, let me point out that neither of the passages cited address the question of praying for the dead. The point of Ezekiel 18 is that a son is neither saved nor condemned because of the righteousness or the sins of his father, and neither is a father saved or condemned because of his son. Also, past righteous will not save a man who falls into sin, nor will past sin condemn a man who turns from his sin. The passage is not about prayers for the dead. The point of Romans 2:3-9 is that everyone will be judged according to his works, This has nothing to do with prayers for the dead either, unless you assume that we believe that by praying for the dead we could pray an impenitent sinner into heaven, but we do not believe that. There are, however, passages of Scripture that do address this question. 2nd Maccabees is not in most Protestant Bibles, but it was included in the 1611 King James Bible, and has been considered to be part of Scripture by the Church since the time of the Apostles (see Canon 85 of the Holy Apostles) -- and in 2nd Maccabees 12:38-45 we find a very clear example of prayer for the dead. In the Wisdom of Sirach (which is also listed among Scripture by the Canon 85 of the Apostles), it says: "Give graciously to all the living; do not withhold kindness even from the dead" (Sirach 7:33). "The Lord grant mercy to the household of Onesiphorus, for he often refreshed me, and was not ashamed of my chain; but when he arrived in Rome, he sought me out very zealously and found me. The Lord grant to him that he may find mercy from the Lord in that Day—and you know very well how many ways he ministered to me at Ephesus." The text from Second Maccabees that has already been cited is clear evidence that this was the Jewish custom well before the time of Christ, but is also a fact that the Jews continue to pray for the dead. So if prayers for the dead were some pagan corruption that crept into the Church, one has to wonder how it also crept into Judaism... especially when this would have to have happened before the the time of Christ. When I first began to seriously consider becoming Orthodox, prayers for the dead were on my list of about 5 issues that had to be resolved, but it was also one of the first issues to be scratched off that list, because the evidence that the early Church prayed for the dead is far too ubiquitous to allow one to doubt it. You find it in the earliest texts of the Liturgy. You find it passing comments made by the earliest writers of the Church. You also find them in the catacombs. For example, we have the Epitaph of Abercius, Bishop of Hieropolis, who reposed in 167 A.D., in which he asks for those who read the epitaph to pray for him. When St. Augustine's pious mother was departing this life, her last request was: "Lay this body anywhere, let not the care for it trouble you at all. This only I ask, that you will remember me at the Lord’s altar, wherever you be" (Confessions 9:27). And quotation upon quotation could be multiplied along these lines. Prior to the Protestant Reformation, there weren't any Christians, anywhere, who did not have the custom of praying for the dead. I remember hearing the story of an Anglican priest who had adamantly opposed prayers for the dead any time the issue was raised, and then after his wife's death he ceased to speak up on the matter, and was asked about it. He said that he had prayed for his wife every day, since he had met her, and could not bring himself to stop after her death. Prayer for the dead is a way the living show their love for dead. We also believe that prayers the dead are of some benefit to them, but exactly how these prayers benefit them is not something that the Church has precisely defined. If someone dies in a state of repentance, but without having had a chance to bring forth all the fruits of repentance, we believe that they are not ready to enter immediately into the presence of God, but that at some point, through the prayers of the Church, they will be. If someone dies in a state of impenitence, while our prayers are of some benefit to them, those prayers cannot make them worthy of the Kingdom of Heaven. But in either case, by praying for the dead, we strengthen our own faith, and come to better entrust our loved ones to God's mercy. "But we have received that even the souls which are held in hell are already given over to eternal torments, whether in actual fact and experience or in hopeless expectation of such, as can be aided and given a certain small help, although not in the sense of completely loosing them from torment or giving hope for a final deliverance. And this is shown from the words of the great Macarius the Egyptian ascetic who, finding a skull in the desert, was instructed by it concerning this by the action of Diving Power. And Basil the Great, in the prayers read at Pentecost, writes literally the following: "Who also, on this all-perfect and saving feast, art graciously pleased to accept propitiatory prayers for those who are imprisoned in hades, granting us a great hope of improvement for those who are imprisoned from the defilements which have imprisoned them, and that Thou wilt send down Thy consolation" (Third Kneeling Prayer at Vespers). But if souls have departed this life in faith and love, while nevertheless carrying away with themselves certain faults, whether small ones over which they have not repented at all, or great ones for which -- even though they have repented over them -- they did not undertake to show fruits of repentance: such souls, we believe, must be cleansed from this kind of sins, but not by means of some purgatorial fire or a definite punishment in some place (for this, as we have aid, has not at all been handed down to us). But some must be cleansed in the very departure from the body, thanks only to fear, as St. Gregory the Dialogist literally shows; while others must be cleansed after the departure from the body, either while remaining in the same earthly place, before they come to worship God and are honored with the lot of the blessed, or -- if their sins were more serious and bind them for a longer duration -- they are kept in hades, but not in order to remain forever in fire and torment, but as it were in prison and confinement under guard. All such ones, we affirm, are helped by the prayers and Liturgies performed for them, with the cooperation of the Divine Goodness and Love for mankind. This Divine cooperation immediately disdains and remits some sins, those committed out of human weakness, as Dionysius the Great (the Areopagite) says in the "Reflections of the Mystery of those Reposed in Faith" (in The Ecclesiastical Hierarchy, VII, 7); while other sins, after a certain time, by righteous judgments it either likewise releases and forgives -- and that completely -- or lightens the responsibility for them until that final Judgment" (see "The Soul After Death", Appendix I, p. 208f). 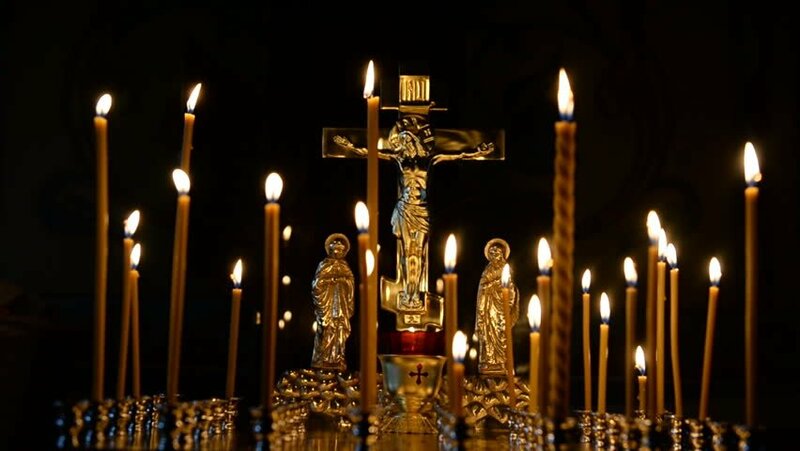 Here also is a quote from St. Symeon of Thessalonika's Liturgical commentary, about commemorations at the Proskomedia: "And there is no place here [in commemorations at the proskomedia] for unbelievers, let alone for the heterodox. "For what communion does light have with darkness?" since, scripture says, the angels will separate out the evil from the midst of the just. Therefore it is also not at all right for a priest to make a commemoration of him; neither for a heterodox, or make a commemoration of him neither for those openly sinning and unrepentant. For the offering is to their condemnation, just as it is also for the unrepentant who receive communion of the awe-inspiring mysteries, as the divine Paul says" (St. Symeon of Thessonika, The Liturgical Commentaries, edited and translated by Steven Hawkes-Teeples, (Toronto: Pontifical Institute of Mediaeval Studies, 2001), p. 232f). Singing the Paschal Hours during bright week make for an easy and joyful prayer rule, and help keep us connected with the celebration of Bright Week, if we are unable to attend services this week. From the Synaxarion of the Lenten Triondion and Pentecostarion, Fr. David and Mother Gabriela, eds., HDM Press, Rives Junction, MI, 1999 pp. 160-161. It's because Facebook thinks drag queens should be able to use stage names like "Lil' Miss Hot Mess," but doesn't think Christian Clergy should be allowed to use anything but their legal names. See "Stories from the Culture War Trenches" by Rod Dreher. Update: They have done the same thing to Fr. Tryphon, who if he used his legal name (which I don't even know) would not be recognized by anyone who hasn't known him since he was kid. Facebook has gotten too big for its britches. It's time for the users they depend on to whittle them back down to size. Refuse to advertise on Facebook until this policy is reversed. Question: "What should someone do during Holy Week if they have no parish nearby, and so cannot attend the services?" We should of course plan ahead, and if at all possible make a way for us to be at the services of Holy Week, but of course there are many circumstances beyond one's control that might prevent them from attending some or all of these services. But as for what to do when one is in this situation, let me give the ideal answer, and then an answer for those who cannot yet deal with it in the ideal way. If you learn how to do reader services, you can actually do most of the Holy Week services in a fairly full way. You can't do the sacraments without a priest or a bishop, but you can do pretty much everything else. This requires investing the time to learn how to sing the services, and also to acquire the texts, but it is time and money well spent. There is also a summer course on liturgics that is offered by the Orthodox Pastoral School. For Lazarus Saturday, Palm Sunday, and Pascha, you can do Typika, which is relatively short service that has many of the elements of the Liturgy. You can get the text for Typika as well as the variable portions for those services by clicking here. For the other days of Holy Week, you can do Akathists, which are found in the Book of Akathists from Holy Trinity Publications. Akathists are not complicated, and so you don't have to know a lot of rubrics to do them. It also doesn't take too much to learn how to sing them. For Holy Monday, Tuesday, and Wednesday, you could do the Akathist to the Divine Passion of Christ. For Holy Thursday, you could do the Akathist for Holy Communion. For Holy Friday, you could do the Akathist to the Precious Cross. 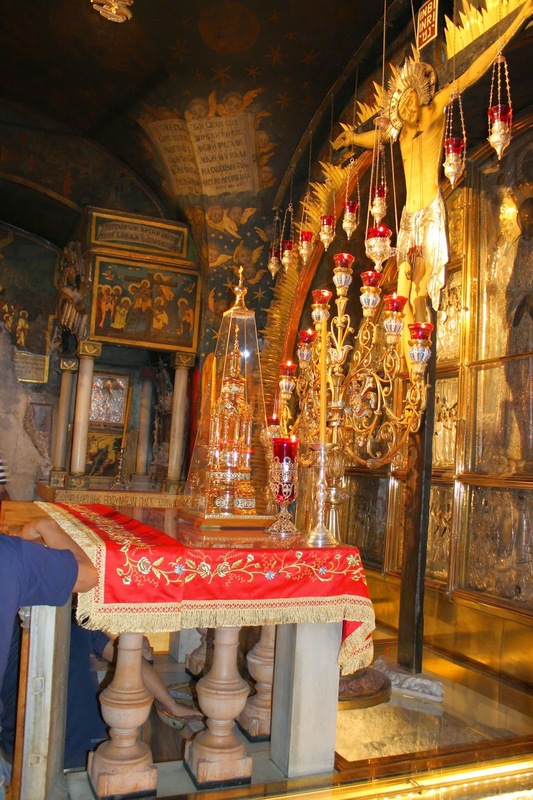 For Holy Saturday you could do the Akathist to the Tomb and the Resurrection of the Lord. And for Pascha (in addition to the Typika) you could do the Akathist to the Resurrection of Christ. One of the Traditions of Holy Week is to read all for Gospels in their entirety on Holy Monday, Tuesday, and Wednesday. If one is working during Holy Week, that might be difficult to pull off, but you could try to read at least one Gospel completely. And in addition to that, you can read the other appointed Scripture readings for the days of Holy Week. For these readings, you can download Menologion 3.0 which provides the appointed readings for each day.